Colombia, widely ignored prior to the 2014 FIFA world cup, offers all-year round paragliding at Andes mountain launch sites across miles of untouched countryside. What better way to see South America then from a bird’s eye view, open to the elements, coffee plantations sprawling below, with actual wing-flapping birds circling round your kite? 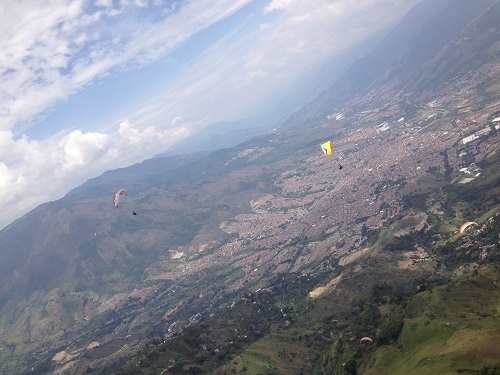 Medellin, nicknamed the City of Eternal Spring and nestled in the equator-hugging Antioquia Aburra Valley blesses nearby launch sites with weather so favourable that hang glider and paraglider pilots can fly every day of the day. My virgin tandem paraglide flight was at the San Felix site with Ruben Motoya from RubenFly, an outrageously friendly pilot with more than 20 years of experience, and most importantly, he spoke fluent English. Take it from me, unless you speak great Spanish you don’t want to dangle several thousand feet in the air, strapped to someone who can’t speak your language! I didn’t have time to be nervous. Health and Safety isn’t really a concept yet in Colombia so I was strapped into a helmet and harness and running off a cliff within moments of arriving on site. My instructor’s GPS system made disturbing noises as we swung upwards but the harness was relaxing and the views were pretty. I’d compare it to a deckchair in the sky. Medellin city sprawled below, snuggled next to waterfalls and coffee plantations and we followed the flight path of birds to catch the best thermals. The Antioquia region, located at the end of a string of green Andes mountains offers several scenic launch sites. “My favourite area near to Medellin is Damasco, Cerro Amarillo and Jerico. This valley, watered by five rivers gives us an excellent landscape and a view that is difficult to forget,” said Ruben, who has been exploring the region since 1992. The all-year-round spring weather and geographically privileged location has fostered a community of both competitive and recreational, experienced pilots. “In rainy weather the view is so fantastic we just enjoy it and take a good rest just watching the clouds pass by or the sunset” Ruben told me. 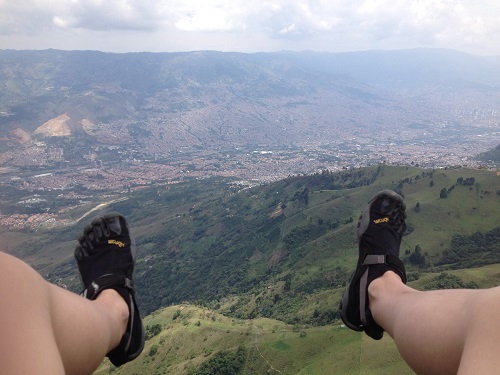 Medellin’s growing reputation as a paragliding hub also gives a different view on city marred by drug-fueld violence. Tourists and beginners are welcomed at the San Felix site, a 45 minute bus ride from Medellin’s north bus terminal costing 2,700 pesos (less than £1). If navigating your way through a busy bus terminal in Spanish doesn’t grab your fancy, split the £35 taxi fare with a friend. Affordability- a half hour flight cost me 80,000 pesos (about £25), compare to BHPA who will charge you £55 for a flight lasting 2-5 minutes. 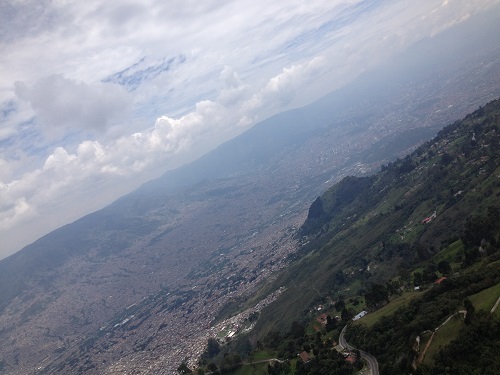 This entry was posted in Air Sports, Featured, Paragliding and tagged Colombia, Medellin, Paragliding. Bookmark the permalink.